Jesus is a beautiful and sweet 18-year-old young man who currently attends a District 75 school in New York City. I was lucky enough to be assigned as Jesus’ physical therapist at the beginning of this school year and he immediately had my heart! He has a cheerful smile and the most adorable and genuine laugh that spontaneously and readily arises many times throughout the school day. Jesus is very sociable and is well liked by staff and peers. He is polite, humble and carries himself like a true gentleman. One of the most amazing qualities Jesus possesses is his sanguine and composed nature. While someone like me can read every meditation book ever written and practice a variety of techniques for years on end in an attempt to attain some level of peace and tranquility in my life, this elusive quality seems to be completely natural and effortless for Jesus. Jesus is unable to walk independently and he uses a wheelchair to come to and from school, which he is able to propel by himself. He can walk short distances with the assistance of a brace that extends from both his hips to his feet and Loftstrand crutches. Jesus is able to transfer to and from his wheelchair independently to level surfaces, but requires assistance with unlevel surfaces. He needs assistance with most activities of daily living, such as dressing, bathing and grooming. However, he has complete function of his upper body and has impressive muscle strength of his upper extremities. Jesus has become my model physical therapy student this year. In fact, he has given me renewed passion and zest for my job. He is extremely motivated and gives his all to any physical therapy challenge I present to him, no matter how taunting it is at first. He never complains and maintains this calm composure and relaxed face even when he is being physically challenged to the maximum. In fact, sometimes the only indication I have that Jesus is working at his upper limits is the sweat beads that form on the back of his neck and his pumping heart when I place my hand on his chest. This year Jesus has worked extensively on using his crutches the entire day to navigate the school environment. This involves walking up and down four flights of stairs to go to the nurse and lunchroom and back to his classroom, as well as walking hundreds of feet in the hallways to transition. While this amount of perseverance and determination is clearly admirable, the fact that he must wear a brace that encompasses his entire lower body makes this an Olympic feat in my opinion. Jesus’ serene and tranquil face makes one think walking is easy for him. It wasn’t until recently that I was truly struck by the intensity of effort and energy output necessary for Jesus to do this. One day Jesus didn’t wear his braces because I needed to examine them off of his body. When I picked up the bag to take the braces out, I was taken aback by how heavy it was. At that moment, it became truly clear to me the extra weight that he must carry everyday in order to be able to walk. This is a testament to not only Jesus’ physical strength, but also his mental and spiritual strength. Jesus loves playing video games, such as the Wii and Playstation. He also likes talking to classmates on his cell phone and surfing the Internet and connecting with his friends through Myspace. But these activities take place only after he does his homework and receives tutoring for reading after school, which is something he has been engaged in regularly since he was very young. It shows, because he is as determined in the classroom as he is in physical therapy sessions and his teacher tells me he is a great student. Jesus has a loving and adoring family that take amazing care of him. He lives at home with his parents, siblings and his grandfather, who shares Jesus’ bedroom. As many young men native to the Bronx, Jesus is a passionate and avid Yankees fan. His favorite players are Derek Jeter and A-rod. Jesus has expressed that he would like the Yankees to be a central theme in his bedroom. We are contemplating the idea of turning Jesus’ room into a mini Yankee stadium. The challenge of the Blissful Bedrooms team is to make this Jesus’ dream bedroom, as well as a comfortable place for his grandfather to rest. Please take a moment to view Before & After pictures of Jesus' bedroom, as well as pictures of the process. PICTURES FROM JESUS' DREAM-COME-TRUE DAY WHEN HE MET THE YANKEES!! 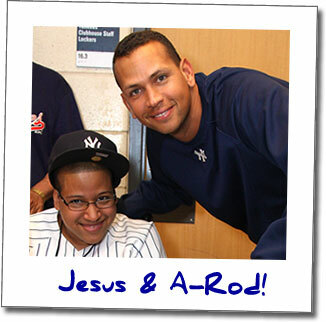 On 6/1/10, Jesus had his dream come true, he met his heroes in blue pin stripes, The Yankees. The Yankees Organization showed their support for Jesus and Blissful Bedrooms by responding to our letter and inviting Jesus to the stadium to meet the team during batting practice and then watch them play a winning game. He not only went home with a baseball containing the players autographs, but also a baseball bat signed right before his eyes by his favorite player of all - Alex Rodriguez. What a perfect prelude to Jesus' Blissful Bedroom makeover, which will take place during the weekend of 6/26-6/27. 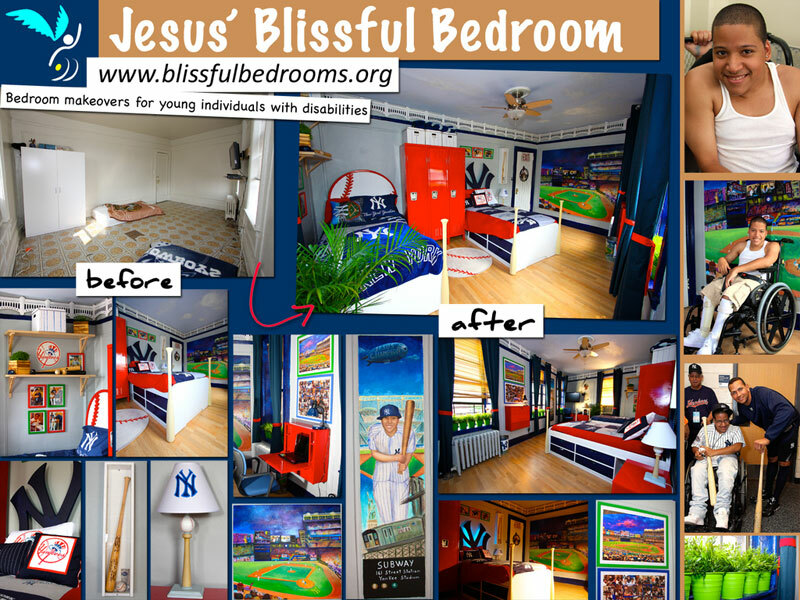 At that time, a team of dedicated and talented volunteers will create the Yankees-themed bedroom of Jesus' dreams. When he lies in his bed at night and looks around his room he will think about the day he met the New York champions and how special and loved he is. Thank you Yankees for showing how much you care! Thank you to all of the talented & dedicated volunteers who contributed to Jesus’ makeover! Thank you to all of the generous organizations and individuals who have supported Jesus’ bedroom makeover by donating funds, services or materials!